Rococo is one of my favorite lifestyle boutiques in Orange County, with two locations in Costa Mesa and Dana Point. Owner Patty Klein Praisler proudly carries high quality and timeless L.A. based brands that you’ll just love. Shop Chan Luu at Rococo in Costa Mesa and Dana Point through December and be entered in a drawing to win a piece of Chan Luu! Ten percent of all proceeds will benefit Hoag Hospital Pickup Family Neurosciences Institute Neurobehavioral Health Programs. 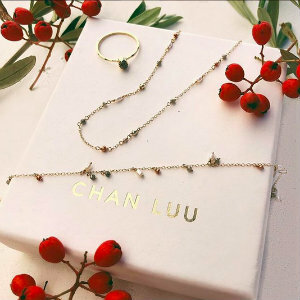 Choose from fashion favorites such as Chan Luu jewelry and clothing (Rococo is one of the largest retailers in California for Chan Luu), Mother, Ramy Brook. 360 Cashmere. The Great, Stateside, Feel the Piece, Sundry. Amo, Lem Lem, Spell, Xirena, Cleobella, Jen’s Pirate Booty, Beautiful People, Antik Batik, Riller & Fount, Stance, Brave Leather, Also Made in The States, and Leslie Crow. You can also follow SHOPROCOCO on Instagram for daily posts of what they have in store. 369 East 17th in Costa Mesa. 949.287.6749. 24040 Camino del Avion in Dana Point. 949.488.0366.